Active galactic nuclei (AGN) are the most spectacular of all astrophysical events, capable of outshining the largest galaxies and driving narrow jets of plasma, travelling almost at the speed of light, which can penetrate millions of light-years into the intergalactic medium. Composite of an e-MERLIN radio image of the "Double Quasar" and an earlier Hubble Space Telescope (HST) optical image. One of the lensed quasar core images is visible at lower right. 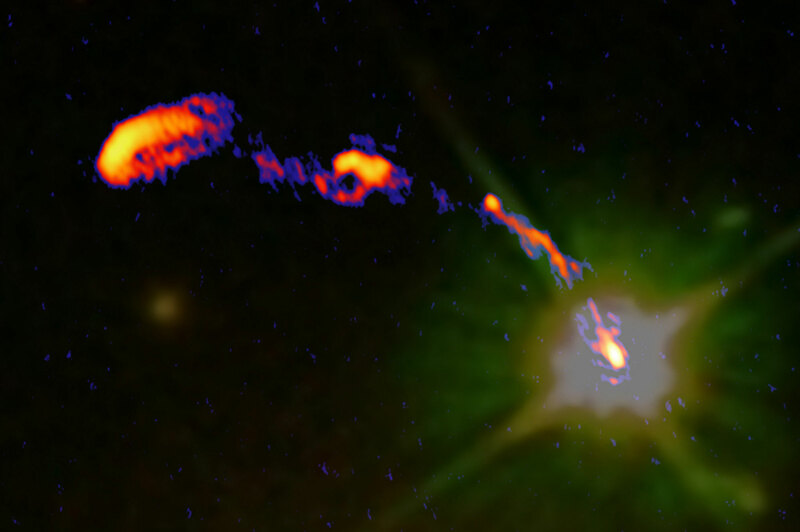 The radio emission generated by the black hole as seen with e-MERLIN is visible as the compact bright region superimposed on the (yellow-green) optical emission seen by HST. Active galactic nuclei are powered by accretion of material onto the supermassive black holes, massing millions to billions of suns, that lurk at the heart of large galaxies. Although the major outbursts (quasars and radio galaxies) are relatively brief episodes in the life of a galaxy, low-level activity persists in the heart of many galaxies, including our own. With the exception of dwarfs, all galaxies have the potential to be active and almost certainly went through a period of intense activity at the time when the central bulge and associated black hole were being formed. But only about 10% of local galaxies are classed as active, though the percentage increases as we look to higher redshifts. Activity is a somewhat slippery concept but is most easily defined as emission resulting from accretion of matter on to the black hole at the centre of a galaxy. Observationally, this activity can manifest itself in the form of Seyfert-like behaviour, ie, re-processed radiation from the accretion disk including strong, broad, high ionisation emission lines and strong blue/UV continuum emission, or as radio emission powered by jet of relativistic particles which can occur either with or without associated Seyfert-like behaviour. The range of optical luminosities can be enormous ranging from LINERS (poor cousins of Seyferts) to quasars which are the most luminous objects in the Universe. The same is true for the radio emission; the most luminous radio sources are usually accompanied by strong optical activity but the converse is not true. There really do seem to be two types of AGN, with 'radio loud' AGN producing jets about 1000 times stronger than 'radio quiet' ones, relative to the thermal radiation from the accretion disk. Most of the research at JBCA focuses on the radio loud objects but even amongst those there is a vast range of luminosities. What triggers a galaxy to become active? This is almost certainly related to availibility of gas to be accreted by the black hole, perhaps liberated by an interaction with another galaxy, but the details of the process remain a mystery. Why are some object radio loud and others, apparently identical in other respects, radio quiet? How are the radio jets produced and what regulates the maximum energy of the synchrotron electrons that are accelerated? Radio loud objects emit over the whole EM spectrum up to gamma-ray wavelengths and the study of their spectral energy distributions is an important topic. How do radio jets interact with their host galaxies? On a global level it is thought that jets in the dramatic early stages of galaxy formation can regulate the growth of galaxies through feedback. In nearby galaxies such physical process can be studied in detail but at a much less grander scale. Exciting times are ahead for AGN science: new radio facilities like e-MERLIN, EVLA, SCUBA2 and ALMA are about to come on line and there is a flood of multi-wavelength data from optical/IR/Gamma-ray surveys like SDSS, UKIDDS, Herschel GLAST. A subset of AGN channel a large fraction of their accretion energy into a pair of oppositely-directed relativistic jets. The jets, in turn, inflate huge bubbles filled with magnetic fields and relativistic particles in the intergalactic gas. Jets and bubbles radiate strongly by synchrotron emission, and these double radio sources associated with AGN (DRAGNs) form the vast majority of catalogued radio sources. Their AGN lie in large elliptical galaxies ("radio galaxies"), and may be directly visible as quasars. Jodrell Bank has been involved in the study of these radio sources since their discovery in the late 1940s: Jennison and DasGupta were the first to reveal the characteristic double structure, and accurate positions from Jodrell Bank lead to the discovery of quasars. AGN structures are highly anisotropic and appear radically different when observed from different directions, and a key step towards this picture was made by the 'Unified Scheme' proposed by Ian Browne and Mark Orr in 1982. High-resolution mapping of radio jets with eMERLIN, aimed at understanding their amazing stability in maintaining a coherent structure over nine powers of ten in linear scale, from the solar-system sized vicinity of the central black hole to the megaparsec radio lobes. Modelling the environmental impact of DRAGNs on the surrounding intergalactic gas, which may control the feedback process that regulates the heating and cooling of the hot gas filling the potential wells of clusters and groups of galaxies. Using the polarized radio emission of DRAGNs to probe intra-cluster and intergalactic magnetic fields via Faraday rotation. In the majority of AGN, the jet outflows are relatively feeble compared to the direct electromagnetic emission from the AGN itself, believed to originate ultimately in the accretion disk around the central black hole. These radio-quiet AGN are commonly found in spiral galaxies, with the most active examples known as Seyfert galaxies. Because these objects are much more common than radio-loud AGN there are many nearby examples, allowing us to study them with high resolution, including resolution of the so-called 'narrow-line region' with the Hubble Space Telescope. Jets in Seyfert galaxies directly interact with the interstellar gas in the spiral disk, and are at least partially responsible for stirring up the non-orbital motion measured in the narrow-line region. MERLIN and e-MERLIN provide radio images with similar or higher resolution to HST, allowing us to study the jets and also the dynamics of the ISM via its radio line emission. Sagittarius A* is the 3-million solar mass black hole at the centre of our own Milky Way galaxy. Although currently inactive it is still a bright radio source by virtue of its comparative proximity to Earth. Very Long Baseline Interferometry is on the verge of achieving the resolution necessary to image its event horizon. The phenomenology of accretion onto a black hole that drives AGN is duplicated in miniature in black hole X-ray binaries, in which a black hole of a few solar masses accretes material from a companion star in a close orbit. Some of these are so similar to AGN that they are dubbed ‘microquasars’, displaying outflowing relativistic jets: famous examples include SS 443, Cyg X-1, Cir X-1 [etc…]. Because of the much smaller mass scale, microquasars go through their outbursts on timescales of days to months, compared to thousands of years for AGN, and so we can follow the whole history with e-MERLIN and VLBI. "DRAGNs are relativity in action"
The above content has a link built in that cannot be removed. It can link to another page on the site eg a Staff Spotlight page, otherwise it just refreshes this page. "Double Quasar" imaged by e-MERLIN Radio Telescope Array.